… “Help! There is a Reptilian Wormhole in my Child’s Bedroom! It was the morning of January 1, 2017 when I stumbled down the stairs, significantly later than my bouncy 8 year old. Both he and his best friend had already been up for two hours and were racing around the house screaming and laughing. Immediately, I headed for the promise of caffeine in order to start this New Year, 2017, out properly. I was shocked and a bit irritated when my son grabbed my hand and said, “I have to talk to you, come here”! I dreaded being shown how to fart into a hat at 8:30 in the morning after having been up until midnight for the New Year festivities. Or even worse, perhaps he wanted to show me another lego structure with twenty different ways to annihilate someone else’s ship. “Mamma, I have something I have to tell you” he said, pushing me onto his bed and then crawling up onto my lap. At this point he had my full attention, as there was something clearly emotional and very troubling that was occurring here. entire adolescence, having ruled out delusion as the reason for their being there; I became very, very curious. “Can you tell me more about what was in your room?” I encouraged him gently. “Okay, can you remember what color they were?” Here, I started crossing my fingers for the color blue to be the answer. “They were purpley-bluey.” Hmm…works for me! Perhaps Blue Avians can arrive in a “purpley-bluey” format! At this point, my son seemed satisfied and a little bored, and hopped off my lap. Job well done! I thought to myself. True to my word, I immediately requested a reading from my friend Abbey (#1). (See resources below in case you ever have two purpley-bluey orbs in your room and you need a pep talk !). Now, because what she does is entirely real and completely authentic; and conveyed so extremely well and with so much wisdom and love, this girl is booked! I received a sweet note saying that she received the request and she can’t wait to help out and it would likely be about six weeks. Not a problem! “Wow.” Honestly, what else could I say other than wow? I was a little blown away, and totally overjoyed that now my son understood how to manipulate space time with portals, and perhaps we didn’t have to study long division and fractions while homeschooling any more! We returned home, and he became rather busy, so I opened Abbey’s message alone. Which was a good thing, as it was not exactly what I had been expecting. To be sure, this kind of message is rare even for Abbey. Close to 90% of her readings are of a positive nature…beings and loved ones trying to find you and communicate love with you in this vast universe. This was not one of those though. You know it’s not going to be what you expected when the first letter is not even addressed to you, but rather, to two lightworkers whom you do not know asking for their help and support with regards to this reading. Abbey had very kindly thought to forward me to others who could counsel me and provide empathy and support for negative encounters. UGHH, that can’t be good! Additionally, Abbey found the reptilians had placed a pyramid of purple energy in my son’s room with its own power source that has been pulsating. Immediately I thought of a conversation I had last week when I told two of my own friends I could actually “hear” the scalar field pulsing at night. (My bedroom is directly above my son’s). Before I shared any of this e-mail with my son, I asked him if he ever hears anything at night. He said every time he put his ear to his pillow, he hears this electric pulsing sound. GREAT!!!! So, who do you call when you have a reptilian wormhole, black ops listening in, and a pyramidal negative energy source in your 8 year old’s bedroom!!?? I was devastated. Feelings and memories of being twelve and having negative abductions started washing back over me. 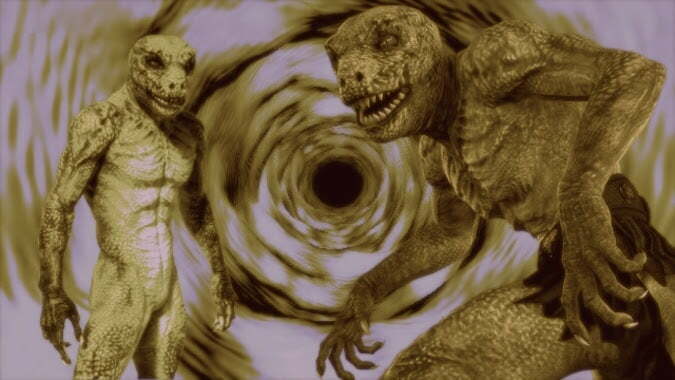 How do you fight reptilians and the occult military? Whom can you tell? Who would believe you? What do you do to protect your children from technology utterly beyond your control? Since he has started working on this channel, he has come into contact with amazing person after amazing person. If there was someone out there in this community who could help point me in the right direction, it was Denny. I emailed Denny and within less than 5 minutes he had emailed me back! That alone nearly brought a tear to my eye. He took me perfectly seriously, and he approached the dilemma with a great sense of sober responsibility and care. In times of panic, the thing that can be most devastating is that sense of utter isolation. That is ultimately how the bad guys expect to win this war; divide and conquer thru isolation and fear! My own husband would have called me crazy for taking this entire situation seriously. In his mind, this was just a little boy’s bad dream. Denny’s immediate response made me feel connected once again, and safe in that connection. He had a number of phenomenal ideas, and a large handful of tremendously gifted and skilled healers whom I might be interested in talking to. What’s more, he also had a video interview with each one of these healers that I could watch on his youtube channel “Why is This True?”! From this point, and with Denny’s help, I was able to reach out and seek help from individuals who were very kind and very compassionate and had a variety of techniques and skills with which to address the problem from a myriad of different perspectives. For instance, Karl Mollison was able to provide healing for each soul in our family by interacting with Source directly (#3). He was able to remove karmic ties to alien beings (and between family members!) and was able to remove the interdimensional portal. He was incredibly honest, and did specify when it comes to alien beings and technology, this is not a guaranteed solution depending on how motivated they are. Then, there was Greg Marra who worked with an angelic Team of Light and was able to see what he called an “intergalactic war” occurring over our house (#4). He was able to clear the house of all demonic spirits (of which there were apparently a whole host!) and set protection from every angle. During the time we talked, he said that war had cleared and the good guys had won! Now, I do not have a meter I can run over my house to check for portals, nor any way of counting how many angels have taken up residence here. I cannot see my karmic ties, much less if check to see if they look tangled or not. What I can measure though is how eager people are to help each other. I can see the goodness of the human spirit. What I can feel is how wonderful it feels to be believed and acknowledged, to have people ready to come to help no matter what the nature of the problem. What I can hear are the voices of my friends assuring me that universal help is coming thru on all sides. Abbey was right, the point of this experience is that love does win over time, no matter the intimidation factor that might be employed. Love is the power, not the weakness. This is the message that my son and I will take away from this unusual experience. Right now is the time of the great gathering of circles. Do not be afraid to extend your hand and join in. For when humanity stands united through love, we will never again be divided! Great prato call life saving article. Thank u so very much for having the courage to write and share this with the public . Wethersfield u hear it or not I know this article has helped many people especially mothers and father’s and children out there. I know this article is 100% true . And Marian Baghor it seems like your the one who needs to do some inner light work not the author of this article. U have obviously never personally had a Anamoulous experience of any kind. So I’m not sure y u r even leaving your NOT 2 cents worth in a comment . Not to mention how evil and cold and cunning u sound. U R THE EXACT REASON Y SO MANY PPL WHO HAVE HAD EXPERIENCES LIKE THIS BECOME ISOLATED AND DEPRESSED. right away u think that the person has a substance abuse issue and is/or crazy. When in reality FYI. They are just more spiritually evolved than u. . And author of this what u told your son about sending love there way cause they don’t like that and giving him that sword was the best piece of advice u could of gave him to keep him safe since u r not going to be right beside him all the time for the rest of his life. ONCE AGAIN ANOTHER POINTLESS DIG WHEN MARIAN SAYS OTHERWISE. God bless u and your family whoever wrote this piece. Thank you Dane. A touching story. But.. maybe I need your helpers too or don’t read properly. As far as I know you’re not a woman (‘My own husband would have called me crazy ‘) and a 8 year old son for you… hmmm. But the story is special. What I feel right now, after reading this article, true or fantasy, I’m sharing my perceptions in blunt honesty, is that love may be the force that is with us at all times, but that wisdom is an equally valuable comrade to it. If I were you Dane Arr, I would decide to get the hell out of where you are, if you’re in that home with all this going on and move to a clean light place, possibly a yurt or a cabin in woodland and begin to start sorting out your priorities. Sobering up. One thing that complicates matters, is the involvement of numerous so called “psychic people” having a good look at all that transpires in your son’s room etc. And another thing that doesn’t seem to work well with an 8 year old kid, is talking with it about a subject that is in itself higly sensitive to imagination, advise it to thrown love at scary beings and give it an imaginary sword. An 8 year old kid wants re-assurement and safety. It wants a mom who shows that she can handle the present moment, in sobriety of attitude. Not aiming for a positive spin with excitement or telling it that “they” were probably friends and that there’s no reason to be afraid for future repetition, when FEAR of the UNKNOWN is the issue, right here… right now, while it crawls up into her lap. “I cannot see my karmic ties, much less if check to see if they look tangled or not. What I can measure though is how eager people are to help each other. I can see the goodness of the human spirit. What I can feel is how wonderful it feels to be believed and acknowledged, to have people ready to come to help no matter what the nature of the problem. What I can hear are the voices of my friends assuring me that universal help is coming thru on all sides”. it shows me how she has unconsciously? ignored her inner work and development of discernment, since she herself had similar experiences in her youth and that she, in that attitude, has left her own gut-feelings and intuitive qualities, bringing her own drama on the stage of a family-home, possbily projecting an issue or two, thrown in with….love? replacing the use of common sense with drawing attention for her troubling and trying times. Take it or leave it, but as long as you haven’t made peace with your own core issues and karmic ties, tangled or strangled and sorted out your purpose as a mother, a wife and a woman, the need of exterior energy-sources and information, solutions, comforting and reassurement that it’s just love throwing in the cauldron of evil that does the job, you’ll be dependent as much as the helpless child on your lap. Well done, Dane Arr. You’ve graduated to proper victimhood. Welcome to the School of Drama. This article was written by jess roberts from Comptche, CA. not Dane Arr. Dane Arr graciously posted this article for ALL of us and especially for young mothers. Victory to the Light! Well, thank you for clarifying, Denny Hunt. I suppose I was talking to Jess Roberts, who may not know of the copying of this story, presented here and a chance to offer her or his feedback. Again, there’s confusion about who’s the author of an article. I’ve suggested to Dane Arr, who published my article “Community – How to live together?” and after which a similar confusion happened, to display the name of the author of an article below the date and publisher’s name. Dane explained to me that this style of presentation is rule according to instructions. After a humorous remark of mine, Dane placed a little detail at the top of the page “Author: Marian Baghor”. A simple soluition.